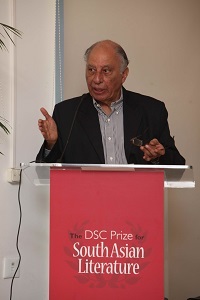 ORGANISERS of one of the most lucrative literary prizes – and covering South Asian writers, themes and geographies specifically, announced a longlist of 10 books for the DSC prize for South Asian Literature 2015 yesterday, in New Delhi. At a well-attended lunch of dignitaries, publishers and the media at the Goethe-Institut/Max Mueller Bhavan, Indian writer Keki N. Daruwalla, who is charing the jury panel for the $50,000 prize, said there was a happy mix of new authors and established ones and that the novels covered India, Pakistan, Sri Lanka, and Afghanistan. Now in its 5th year, the winner will be announced at the Zee Jaipur Literature Festival next year, with a shortlist of six to be declared in London on November 27. Daruwalla said: “It has been both exhausting and rewarding going through these seventy five novels. “As expected the variety is considerable. Obviously there was a tremendous mix here – of themes, landscapes, styles, issues – both political and personal. Daruwalla said the variety and scope was a marvel in itself. “To give an idea of the variety, a schizophrenic from Bihar imagines conversations with Sylvia Plath and Blake. Soldiers returning from the Great War (1914-1918) find life different in the NWFP. A Sri Lankan car driver on hire visits places – the subtext here is the exploration of the past,” he added. Among this year’s distinguished judging panel are John Freeman, author, literary critic and former editor of “Granta” from the US; Maithree Wickramasinghe, a professor of English at the University of Kelaniya, Sri Lanka and the University of Sussex and an expert on gender studies; Michael Worton, Emeritus Professor at UCL (University College London) who has written extensively on modern literature and art; and Razi Ahmed from Pakistan who is the founding director of the annual, not-for-profit Lahore Literary Festival. The prize was created – and continues to be sponsored – by DSC, a multi-national infrastructure company with Indian roots and run by the Narula family, who divide their time between India and the UK. Previous winners of the $50,000 literary prize are Cyrus Mistry “Chronicle of a Corpse Bearer” last year, Jeet Thayil for “Narcopolis”, Shehan Karunatilaka for “Chinaman:The Legend of Pradeep Mathew”, and HM Naqvi for “Home Boy”. Sailesh Ram, editor of www.asianculturevulture.com, adds: “A really interesting and exciting mix on paper and a chance to get to know some authors and novels which have had little attention to date. “What sticks out are the big name authors: Lahiri, Shamsie, Hosseini, Gunesekera – all have already attained a certain degree of commercial success – and while the quality and scope of their writing may be in little doubt and a reason for their inclusion here – there is far more to be gained from picking a winner from the other six – but that is just a personal view. “Nevertheless, we at www.asianculturevulture.com are looking forward to getting to know more about the lesser known writers and their novels.